Sometimes you need a haircut, but you just don’t have the time. 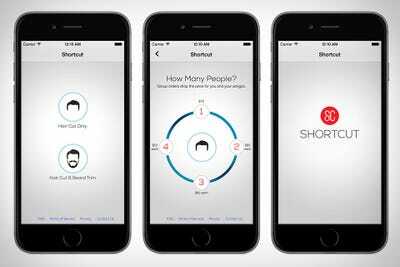 That’s the concept behind the startup “Shortcut,” a new app that will send a barber to your home, office, or hotel. It’s basically “Uber for haircuts,” an increasingly popular idea in the app ecosystem that’s fast turning your smartphone into a service-requesting Swiss Army knife. Interested and in need of a haircut, I agreed to try the service out at Business Insider’s office in New York City. “Shortcut” prides itself on being available when other barber shops aren’t, so you can request an appointment any day of the week or weekend from 8 a.m. to midnight. 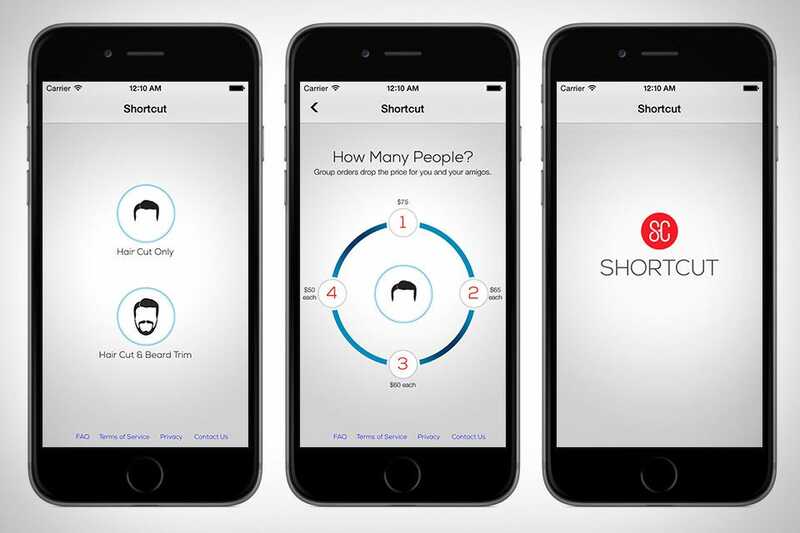 Once you give the app your details and location, “Shortcut” lets you choose if you want just a haircut or a haircut and beard trim as well. Beardless, I opted for the a basic haircut. Now “Shortcut” isn’t exactly a budget option for getting your haircut. You’re not only paying for a licensed barber, you’re also paying for the convenience of getting your haircut in the comfort of your own home, office, or hotel, and that comes at a premium. Haircuts start at $US75, but first-time users get 20% off automatically just by creating a profile. That’s still pretty expensive for a haircut, but “Shortcut” also has a built-in discount if you can convince your roommates or coworkers to get a haircut while the barber is there. If you can find three other people, the haircut price drops to $US50 each. Still expensive, but again, you’re essentially paying for a house call. After requesting a haircut, the “Shortcut” team will dispatch a barber to your location, which takes 30 minutes or less. The barber assigned to me was named Pedro, who also happened to be the director of operations at “Shortcut.” Pedro arrived on time, dressed smartly, and with a small bag that held his supplies. 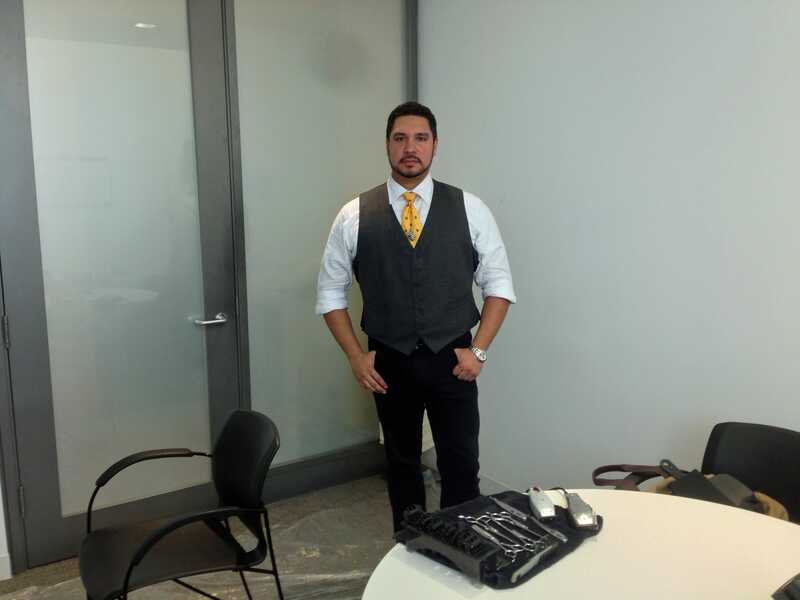 I showed him to the small conference room that I had booked for the appointment, and he promptly began setting up, laying a clear plastic sheet down over the carpet and placing a small cloth over the table to hold his various clippers and scissors. The setup time was quick, and in no time I was sitting down, facing a wall without a mirror, and getting my hair cut with my coworkers busy just outside the room. Pedro mentioned that getting a haircut without a mirror in front of you can take some getting used to, but he had a hand mirror with him, and said I was welcome to take it into the bathroom to get a look at the back of my neck if I wanted. It’s an odd feeling, getting your haircut in the place where you work, and I can imagine there’s a similar feeling at home. It’s not unpleasant, but haircuts are usually something I get done on weekend or after work, and blurring the lines between the two takes some getting used to. Luckily, Pedro was easy to talk to, and he told me about how he’s in charge of vetting barbers hired by “Shortcut,” which is more than just checking that they’re licensed and conducting a background check. Pedro said “Shortcut” barbers are in a unique position. Customers are inviting the barbers into their personal space, and that requires a barber who is able to adapt to how talkative or quiet a customer is that day. For example, Pedro said for some people, a haircut is an opportunity to relax and close their eyes, while some customers are paying to get their haircut at the office so they can continue to work, with some even talking business over the phone during their appointment. 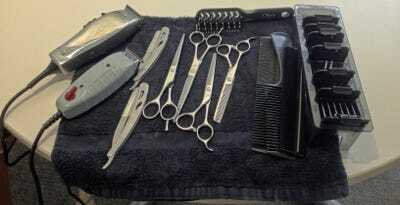 “Shortcut” has seen it all, and its barbers are trained to adapt to whatever environment a customer prefers. From start to finish, the haircut took about thirty minutes, and I was pleased with the result. 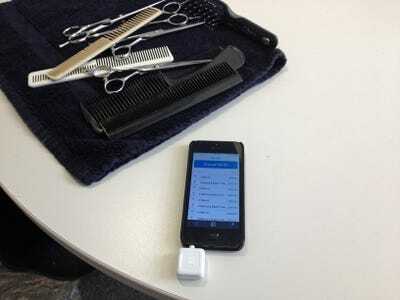 Payment is handled through a Square credit card reader, which every “Shortcut” barber has on their smartphone. Cleanup was quick. Pedro folded up the plastic sheet from the floor, stowing it away in his bag with his collection of buzzers, clippers, and scissors. For now, “Shortcut” is only available in New York City, but its founder says they’re planning to expand in the future. At the end of the day, I’m glad “Shortcut” exists. While $US75 or even $US50 is still far too expensive for my budget, it’s a great option for those who are busy or in need of a last-minute haircut, and you can’t beat its convenience or quality. You can download “Shortcut” over at the App Store.